That coat you're wearing is stunning! Ah I need that coat, it's perfect! I received the bracelet by the way - thank you again! I just love the panda hat in those last photos! i absolutely love your coat. LLove your outfit, you are so sophisticated looking. Man youve made me realise i need to go back to h&m now to get those trousers... i had just gotten over them and BOOM there they are first post i need to read! Its a sign :P i love the trouser collection at h&m atm :) what do you think about it? I love the collar of this shirt! Amazing! Amazing photos! Your outfit is gorgeous, and I love the jewellery snaps too! 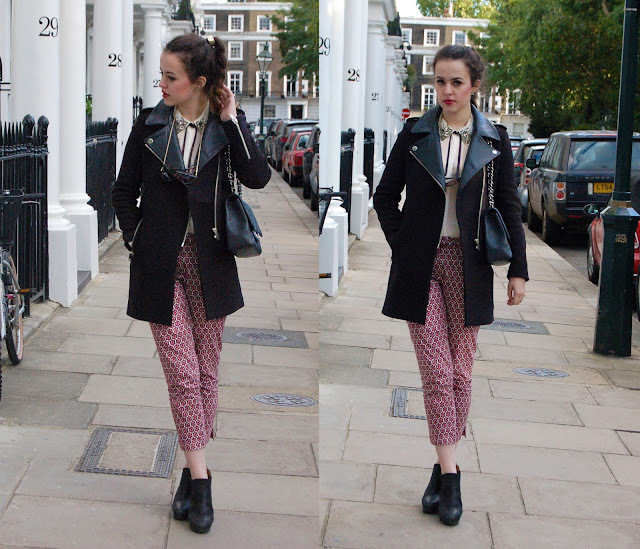 Lovely set of photos - love the coat and trousers! Deeply in love with your pants. Lucky you, I love your coat its gorgeous! The neon jewellery is amazing! i need that coat in my life! ahaha! love it! the show looks amazing! Amazing photos and you look wicked! I've wanted that coat for ages, it's amazing and looks great on you! I want that coat so baaad! its gorgeous. You always look so well put together and classy in a youthful way :) serious wardrobe envy! haha hope you had a good time! LOVE this coat, I am excited to wear all of mine again! you don't even know how jealous i am of that coat! i've tried to hunt it down so many times now, that i think i may just admit defeat. you look stunning as usual! Yay, that's a stylish jacket. Love the embelleshed collar and coat! also whatever that dessert is i want it! 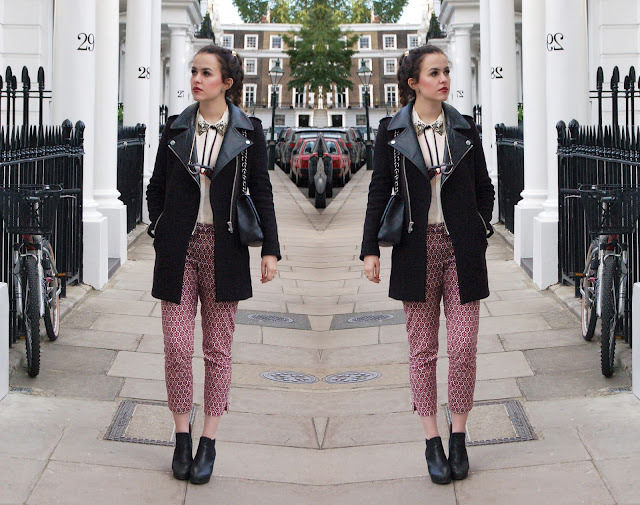 Your jacket and trousers are both absolutely gorgeous - perfect! Swooooon at the jewelled collar! Your outfit is perf. You look stellar, what a cool outfit. Jealz of you attending that LFW show! Thank you so much for your lovely comment on my blog!!! I'm following you now =) Loved your blog too!